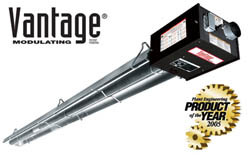 Modulating Radiant Tube Heaters, Radiant Heating Equipment, Vantage Modulating, Energy Saving Products, Inc.
New! Modulating radiant tube heaters. Variable speed motor and variable gas valve allow perfect combustion over a continuous modulation range. 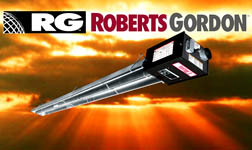 Unlike two-stage heaters, combustion efficiency is maintained over the entire range.